We’re working hard in Form 5 this week! 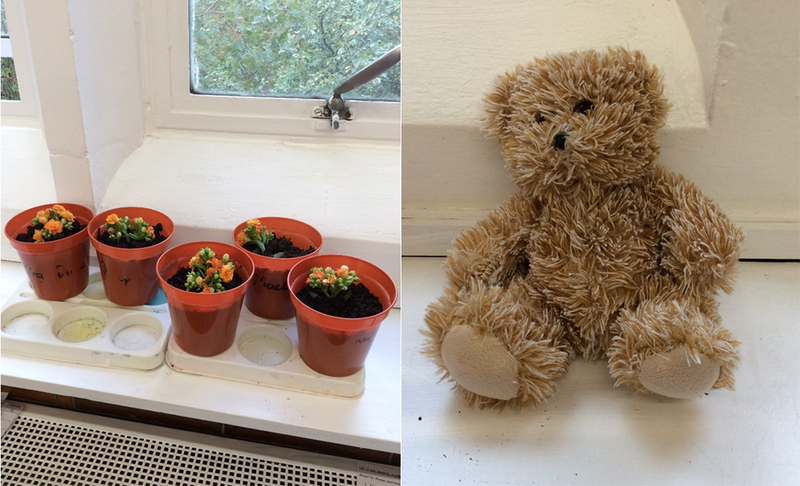 In Science we have been learning about types of flowering and non-flowering plants. We took a flowering plant and made some stem and leaf cuttings from it, then transferred these to new pots to try and grow them! You can see a picture of them here. Rehearsals for Macbeth are ongoing (we’ve even been to a drama workshop in Lambeth this week to meet some of the Shakespeare Schools Festival people!) It’s not just our acting skills that are getting a workout though – we’ve also been writing character and setting descriptions based on the play! Finally, there’s our class mascots: Tom, Ted and Fred. Each week someone from our class takes one of them home and tells us all about their exciting adventures the following week! Here you can see Ted taking a well-earned rest after an exciting weekend away.